On Guraidhoo island, in South Malé atoll. 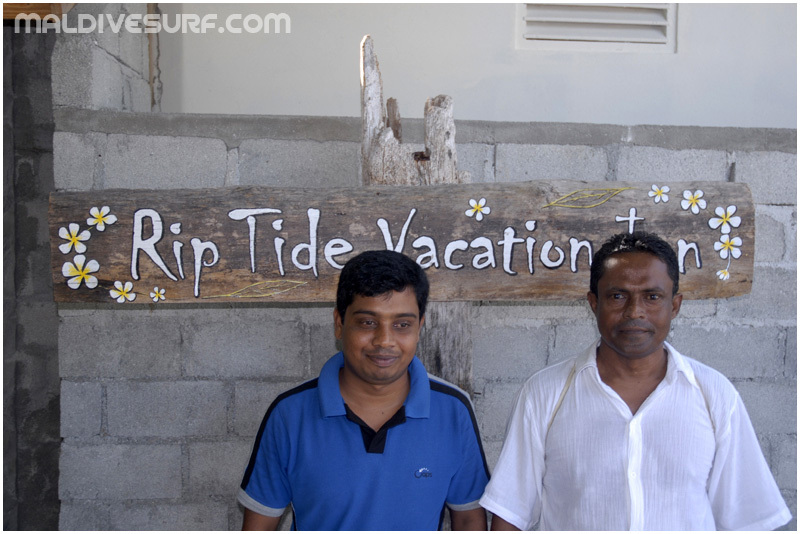 Guraidhoo Guesthouse is located in front of Foxy's left and Riptides rights. Those are the 2 breaks adjacent to the island. Foxy’s is a fast shallow left hander, only semi-consistent, while Riptides (aka Last stop) is a super fun right. You have to cross a 40 m channel to get there. Riptides is consistent and works pretty much at all tides. There are occasional safari boats that show up but crowds are generally much lighter than North Malé. Because South Malé picks up a bit less swell than North Male, we'd recommend to get there during monsoon season : May 15- Oct 15. 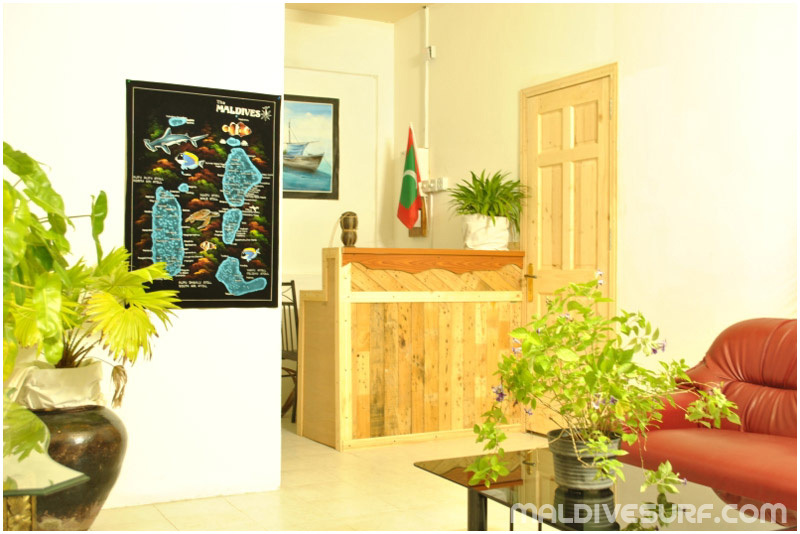 The Guest-house sits on the eastern water front, with a view on Kandooma Resort. There are 7 rooms : 1 triple room, 1 double room, 5 twin double rooms. 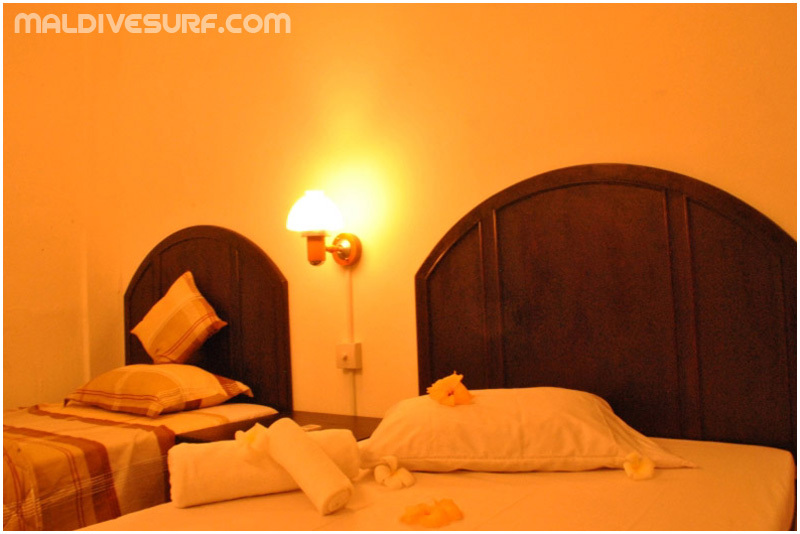 All the rooms have Aircon with hot & cold water, the management provide towel and room cleaning every other day. 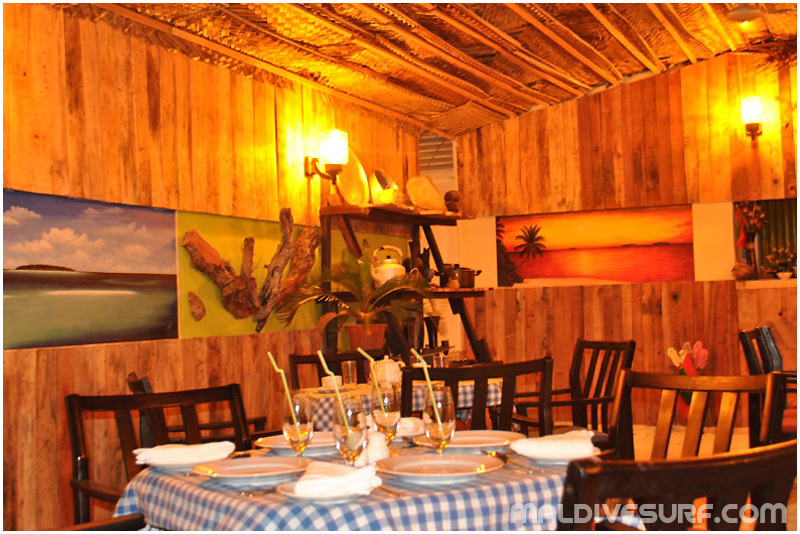 All meals are taken in the restaurant, where food is being a bit adapted to western standards (less spicy!). In the backyard, there is a private and totally safe area to keep your surfboards in a rack with an outdoor shower. 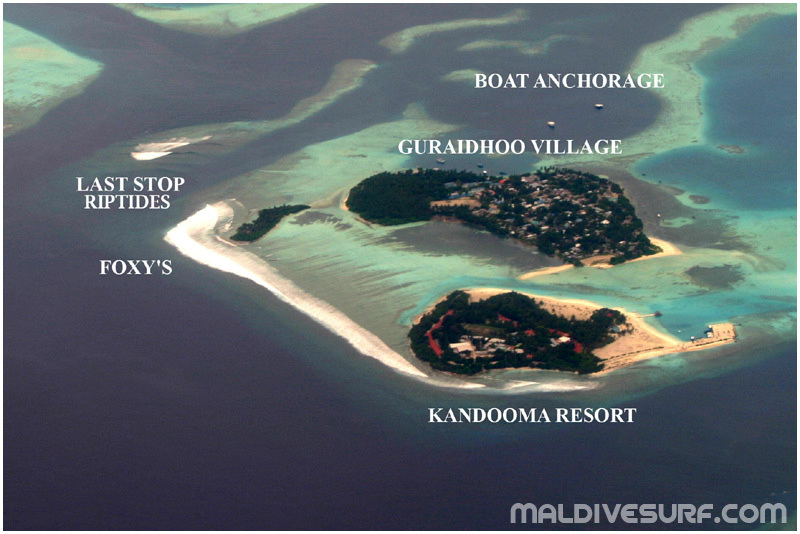 Guraidhoo is a small fishing island with 1200 people. 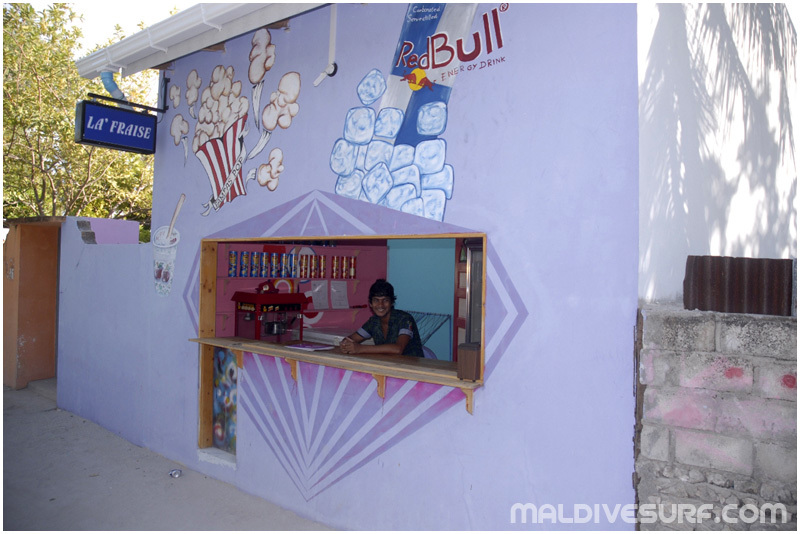 There are a few guest shops where tourists from the surrounding resorts like nearby Kandooma buy their souvenirs. The youth play football every day, to join in, they’ll love it. 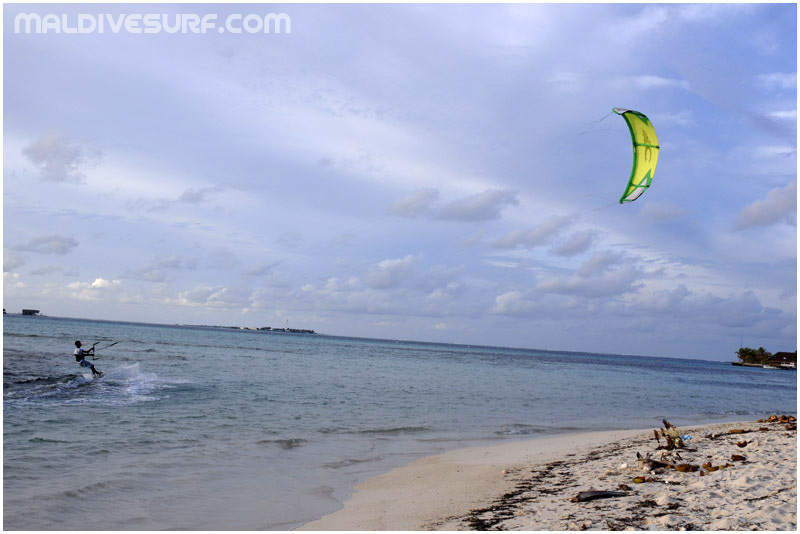 Kitesurfing is an option near the sandy shallow lagoon west of the island. Your host might be able to arrange some fishing lines and try fishing, as there’s plenty of fish around. Don't forget your snorkel equipment ! There are 2 small cafes to have a drink outside the guest-house. Wifi is available from your room. That’s the most affordable land-based option in Maldives. Price includes aircon room, and 3 meals a day. Notes : prices for 2019 with bed tax (8 USD) and GST (12%) included. Expect 45 min for transfers from airport to Malé (dhoni), then from Malé airport jetty to Guraidhoo dhoni jetty (with pick up taxi for your boardbag, 3 USD). A chartered dhoni would cost 250 USD. No speedboat transfer option so far. Notes : prices for 2013 with bed tax (8 USD) and GST (8%) included.